This is only my second V.C. 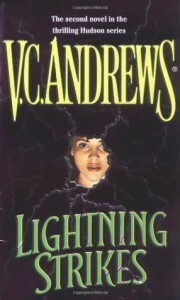 Andrews book. The first one was Heaven and it has been some time since I read it, some time in terms of years, that is. I am not a V.C. Andrews fan. I just read both of these books because they came my way and I feel a compulsion to always be reading something. I think I notice a pattern about V.C. Andrews books though. I base this on the two books I have read and on bits and pieces of information that has passed my way over time. That is that V.C. Andrews writes about some very poor and deprived young woman who finds out that she is related to a very rich family and then goes to live with them. Then the patriarch of the family turns out to be some kind of sexual pervert. That was the basic plot for both this book and for Heaven. This would not take very many books to get really boring. If I am misperceiving the pattern of V.C. Andrews books then leave a comment correcting me. I will say that the book was entertaining enough, so I am giving it three stars, but there is not a lot to make me seek out V.C. Andrews books in the future. I may read more if they just happen to come my way again, but if the plot is going to be the same every time I don't see seeking them out.